The Mitsubishi Trium Eclipse MT450 just pipped the Ericsson T68m to be the UK's first phone with a full 256 colour screen. It became a hot Christmas gift for 2001. It was not quite the first phone with a colour screen, the Siemens S10 from 1997 had that honour. However the Siemens S10 only offered four different colours of text on an LCD screen and by 2001 was all but forgotten. 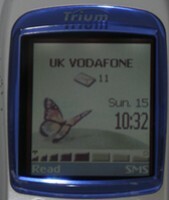 Equipped with WAP and GRPS connectivity, the Trium Eclipse was an attempt to produce a gadget phone and the novelty of the colour screen boosted sales. The Trium Eclipse looked shiny and the silver and blue colour scheme was probably on trend. The Trium made the most of its colour display with a butterfly logo, perhaps symbolising the rainbow of colours available. There was also a bowling game. More seriously, the phone offered WAP browsing and GPRS connectivity. It was a little on the chunky side for the era and still had an external aerial. Something for which Ericsson and Nokia had already found a way to do without. It also felt a bit cheap compared to Nokia phones and was way behind on usability. The Ericsson T68m which came out soon after was a much better looking phone and this soon took the gloss off the Trium Eclipse.